What's that drumming sound? A question often asked here in the Midwest. A resonant drilling noise can be heard on shingles, gutters, house siding, utility poles, garbage cans and dead trees. The culprit ... woodpeckers! Below I feature several members of the Midwest Woodpecker Drill Team. 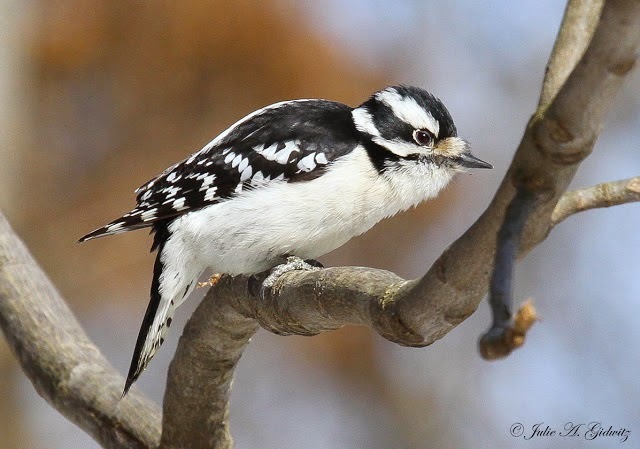 The downy is North America's smallest woodpecker. They are one of the most widespread species and a common sight at parks, woodlands, as well as other locations. 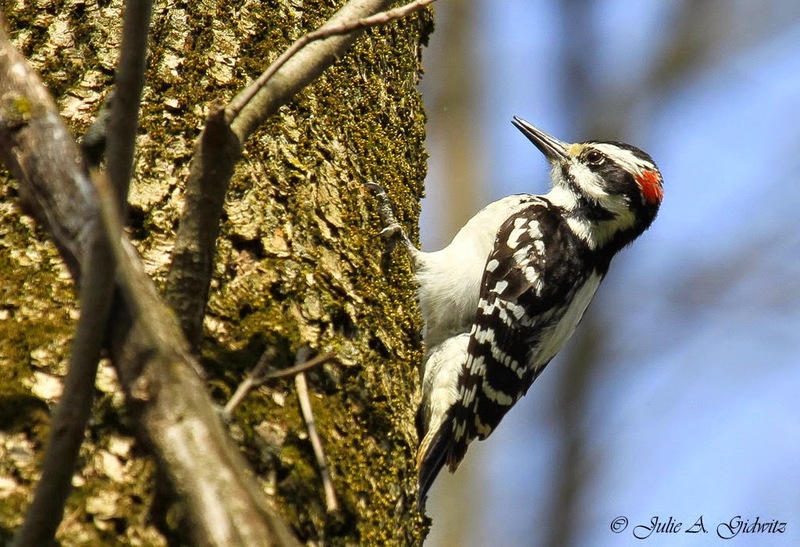 A large portion of the Downy Woodpeckers diet consists of insects, the likes of caterpillars, beetle larvae and ants. 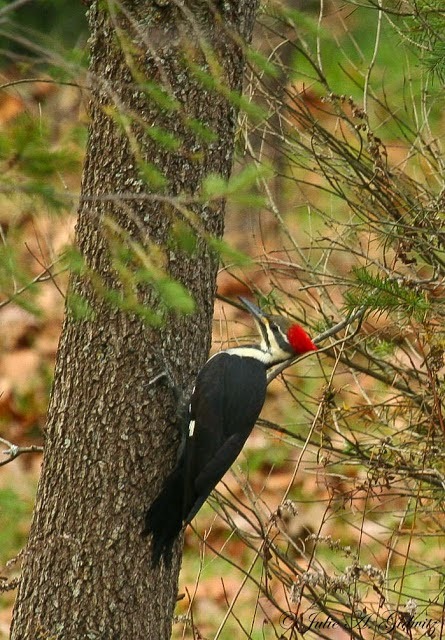 They also eat fruits, seeds, and sap from sapsucker woodpecker drill wells. These woodpeckers visit backyard feeders often to dine on black oil sunflower seeds, suet and steal sips from hummingbird feeders. Female Downy Woodpeckers forage on large branches and tree trunks, males seek prey on the smaller limbs. During breeding season, both the male and female downy pair will work together on a nest hole. This task can take from 1 to 3 weeks. The excavated cavity is then lined with wood chips. The female and male look identical except the male sports a vibrant red occipital cap. 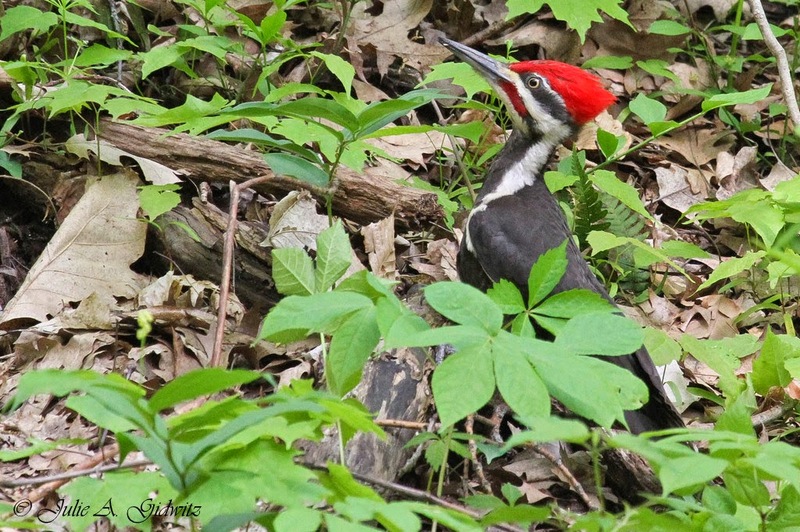 Pileated Woodpeckers are large woodpeckers measuring 16.5 - 19.5 inches in length, with a wingspan of 27 - 30 inches. These red-crested birds feed primarily on ants, termites, beetle larvae, tree-boring bugs and other insects such as grasshoppers and caterpillars. Acorns, nuts, tree cones and various fruits are also on their menu. When seeking food, Pileated Woodpecker are known to excavate impressive rectangular holes in trees. These holes can be a foot or more long and reach deep inside the wood. Round holes are used for nesting. Males do most of the work when excavating the nesting cavity, especially at the beginning. When the hole is nearing completion, the female will assist in the work. Pileated Woodpeckers can be quite clamorous. Their vocal calls and drumming can be heard from up to a half a mile or more away. Males can be distinguished from the females by their scarlet mustache (females have a black mustache) and red forehead (females have a black forehead). Though, noticeably red-headed, the rosy blush seen on the lower portion of the belly gives the Red-bellied Woodpecker its name. Males have a red crown and nape, whereas females have a gray crown and red nape. Red-bellied Woodpeckers are commonly seen in the eastern half of the United States and can be found in open woodlands, forests and parks. They consume vast numbers of wood-boring beetles, grasshoppers, spiders and other insects. They will also feed on acorns, nuts, pine cones and fruit. Occasionally they will eat bird nestlings, tree frogs, lizards and small fish. This boisterous woodpecker can extend its long tongue about 2 inches beyond the tip of its beak. The bird produces a sticky spit and uses its barb-tipped tongue to extract prey from tree crevices. Red-bellied Woodpeckers will store seeds, corn, nuts and insects in tight bark crevices to be consumed at a later date. 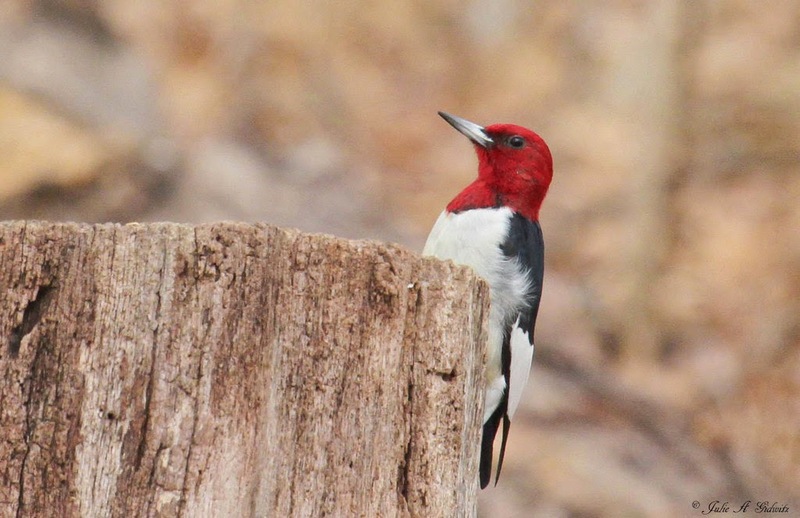 The handsome Red-headed Woodpecker with its striking plumage has many nicknames. The "flying checkerboard", "patriotic bird" and "shirt-tail bird", to name a few. 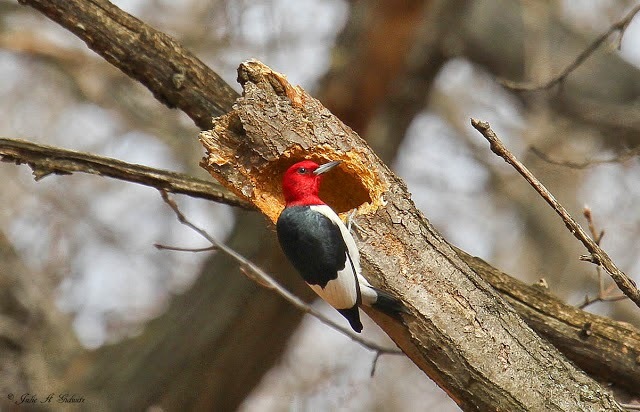 Of all the woodpeckers in the United States, Red-headed Woodpeckers are the species least likely to drill for food. They will often catch insects on the wing, as well as fly to the ground to nab prey. 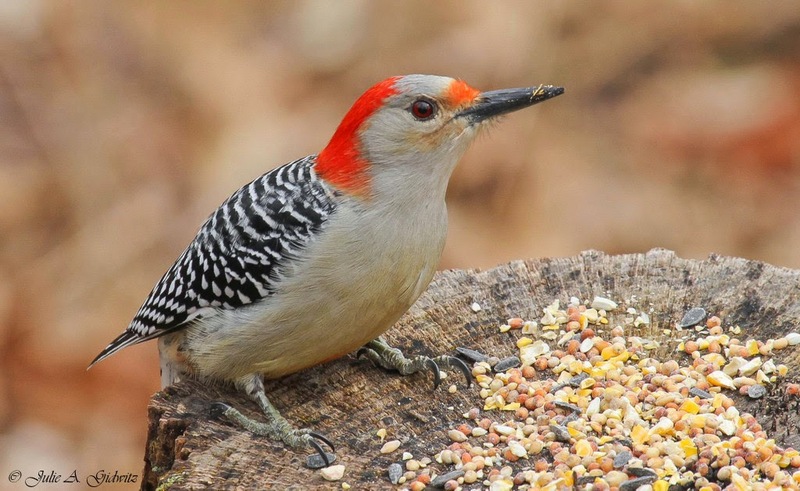 Like the Red-bellied Woodpecker, they store food in bark crevices for future consumption. There are reports of these handsome woodpeckers caching live grasshoppers and beetles into tree cracks and covering them with wood or bark. 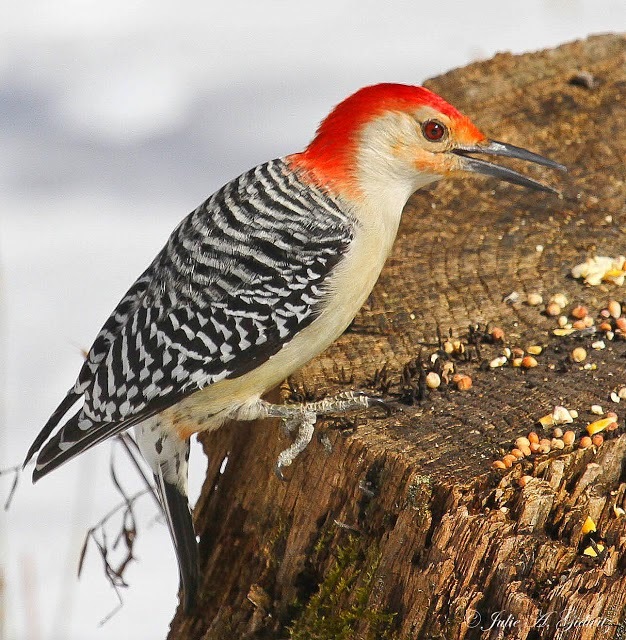 Red-headed Woodpeckers also eat a variety of insects, fruits, and seeds. Male and female Red-headed Woodpeckers are identical in plumage (sexually monomorphic). Though some are permanent residents, Red-headed Woodpeckers migrate during the day and for short distances. Yellow-bellied Sapsuckers drill holes into the inner bark of a tree in search of sticky sap. Using their short bristly tongues, they lap up the oozing fluid. 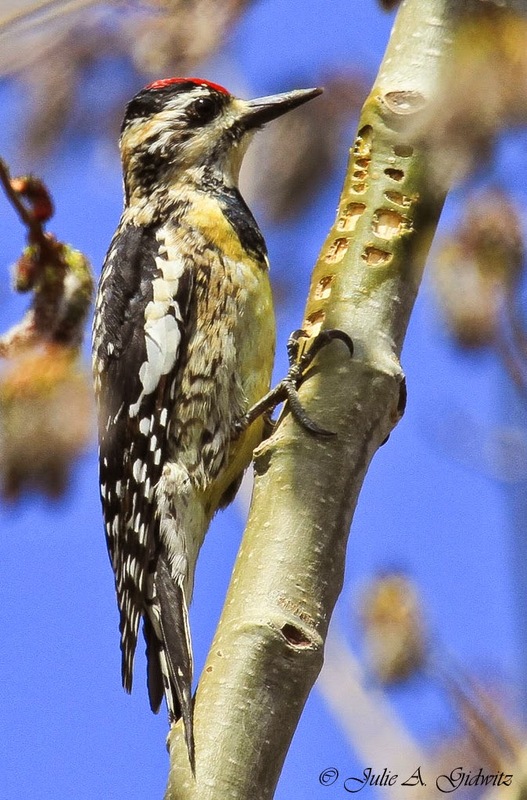 Yellow-bellied Sapsuckers are considered keystone species. Squirrels, bats and many other animals and birds depend on the sap holes, as well as the protein-rich insects they attract, for sustenance. 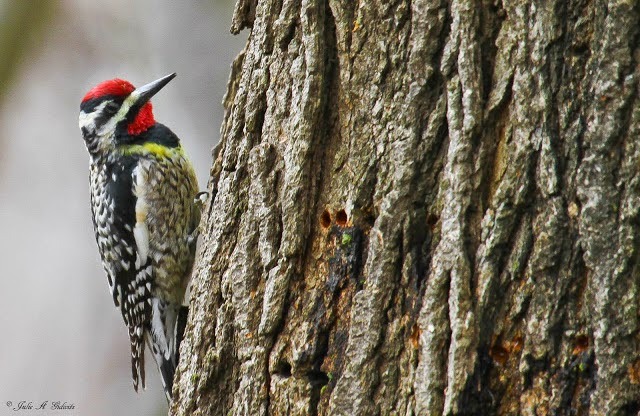 When harvesting sap, these woodpeckers excavate two kinds of holes. They drill deep, round holes that flow sap continuously, and shallow, rectangular holes which need to be maintained to keep the sap flowing. Besides sap, these migratory woodpeckers will eat insects attracted to the drill wells, berries, fruits and tree buds. Spiders and ants are also on their menu. They occasionally can be seen drinking sugar water from Hummingbird feeders. The female looks similar to the male but has a white throat and paler underparts. The main staple of a Northern Flickers diet is ants. These woodpeckers are often seen in open spaces, digging in the dirt and using their barbed tongue to capture large quantities of ants. Flickers also eat beetles, a variety of insects, fruits and seeds. When attempting to capture prey, they can extend their long tongues up to 2 inches beyond the tip of their bills. 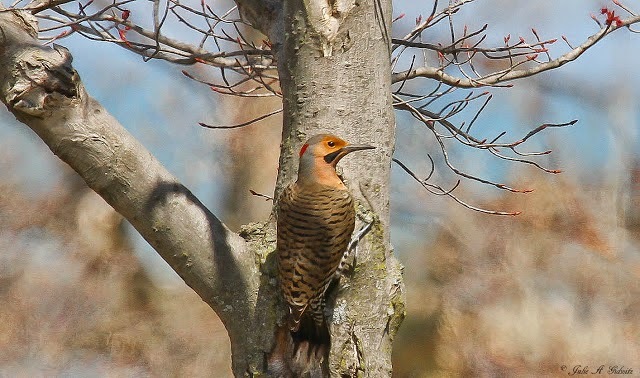 Northern Flickers use their drumming technique to attract a mate, and also as a form of communication in territory defense. The flickers plumage coloration allows it to blend in well in the forests and woodlands where it lives. Males can be distinguished from the females by the presence of a black mustache. Northern Flickers have a black crescent bib on its upper chest, a prominent red chevron on the back of its crown and a white rump. Of the five Northern Flicker subspecies, there are two distinct geographical groups. The Yellow-shafted Flicker form can be found in the east and northwest. 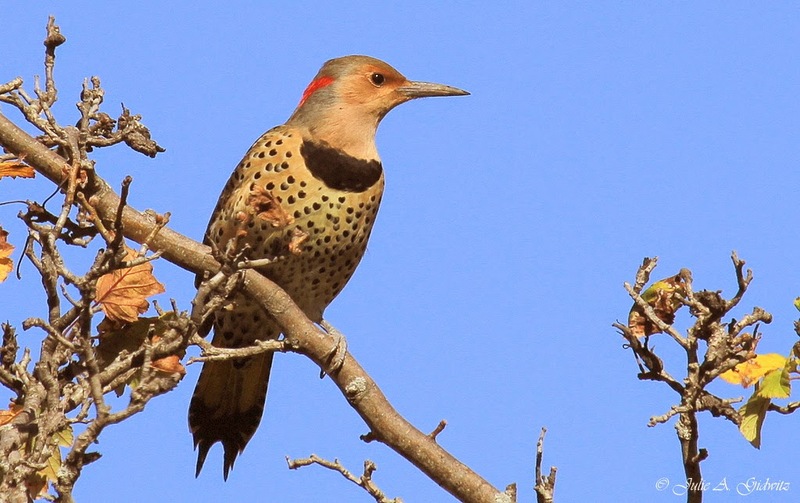 The Red-shafted Flicker form can be found in the western United States. Hairy Woodpeckers look very similar to Downy Woodpeckers but there are noticeable differences. The Hairy Woodpecker has a larger, longer bill and the white outer feathers of the black tail lacks spots or bars. They are also larger in size and have more slender bodies than the downy. Like the Downy Woodpecker, males have a bright red patch on the back of their heads, females lack this patch. These birds can be found in all types of forests, they also frequent gardens and residential areas. The Hairy Woodpecker enjoys a great assortment of foods, especially insects. They are partial to caterpillars and Gypsy Moths. Other insects consumed include ants, beetles, grasshoppers and spiders. Nuts, seeds and some fruits are also on their food list. The male does the majority of the nest cavity excavating, but the females will contribute. The female lays 3 -6 eggs and incubates them during the day. The male takes over the task in the evening. What a great post today and many varietes of beautiful birds ! I love your great photos and admire your knowledge about birds ! 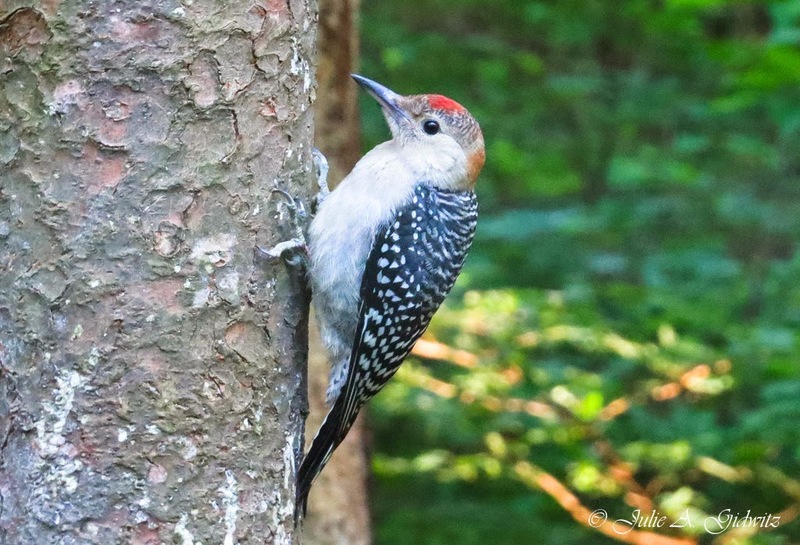 Beautiful photos and interesting information for someone who doesn't have woodpeckers to see! Wonderful collection of woodpeckers! These guys are pretty amazing. There is one from the group I'm hoping to see at some point but what a diverse and colorful group of birds! Julie, what beautiful shots of one of my favorite species of birds! I love to have them visit my feeders. I have yet to see a sapsucker in my yard, but I have seen them other places. Beautiful photos! Greetings from Montreal, Canada. Yay for the Midwest woodpeckers! Lovely photos, Julie. They're such a nice addition to the songbirds that come in to feeding stations. On our land near the Canadian border we have both Black-backed and Three-toed, too. These are wonderful woodpecker photos! I especially love the Downy with it's wings spread. I happen to like the sound the woodpecker makes on our corrugated steel barn roof. Quite a noisy guy. He seems to like it too. You'd think it would give him a headache! And I like the sound the pileated makes. He looks like a pet Fred Flintstone might have had. :-) I so enjoyed these photos! Thank you for stopping in at Cranberry Morning and putting up with my nonsense. I love the 2nd and 3rd photo! Honestly, all the photos on both your blogs are lovely. It's difficult narrowing down which one's I like best.